Auction Closed. Sold via Buy Now $800. Next Auction Monday, Jan 9. Something told me to head south. It had been a while since I visited Brattleboro. I found a thriving community with a bustling, dynamic downtown vibe. At least it felt that way as I darted in and out of traffic with my camera. All the best to you and yours for a happy, healthy 2017! 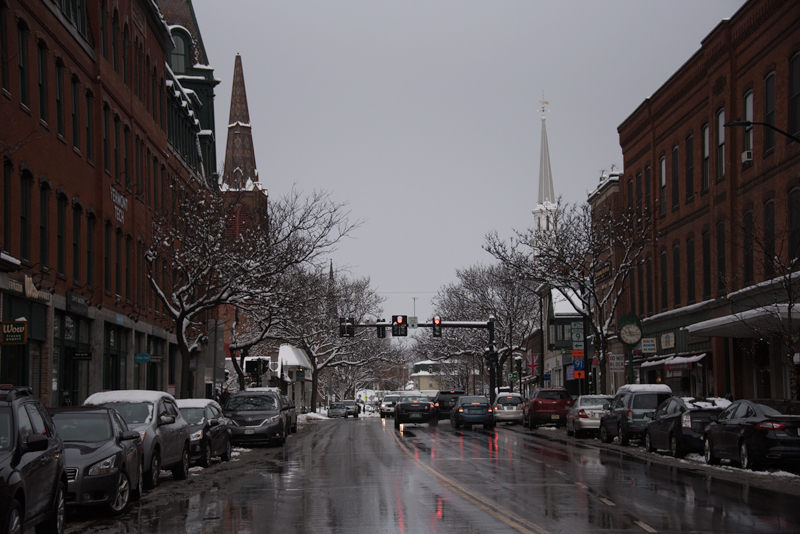 What a soggy day in downtown Brattleboro! 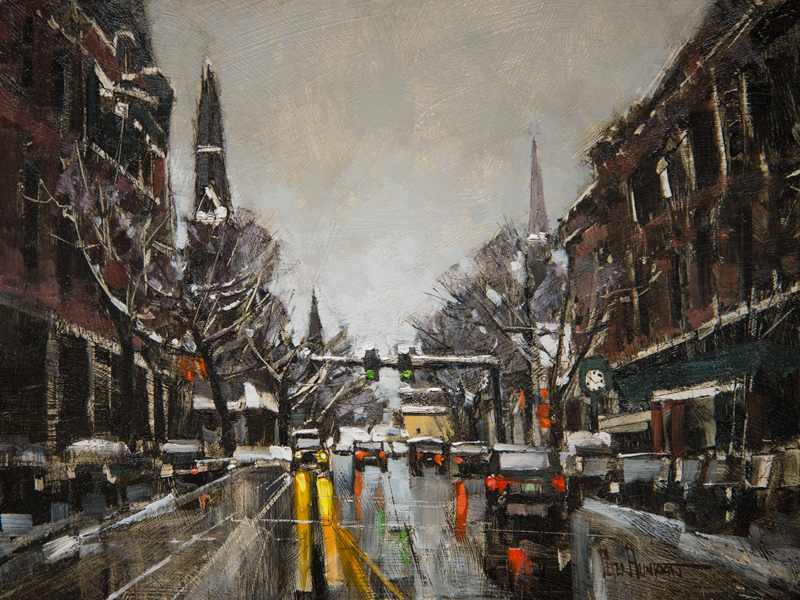 Great renditions of the wet streets, cloudy skies, and remains of a recent snowstorm. All is not sunshine and birdsong at this time of year in Vermont! P.S. Love the careful attention to proper perspective throughout. Well done! Hi Brian, you always look like an eagle and you discover the secrets of Peter’s paintings. Nice to read it. Peter does all the work while we get to enjoy it! Lucky us! Thanks very much Brian, I find I’m attracted more and more to the “less than ideal” aspects of weather. More drama and mood opportunities to depict there. Love it…feel like you are there! I don’t remember many cityscapes by you. This is so well done…I feel like I am right there. I LOVE it too…feel like I want to move there ! You just keep getting better. The sky has wonderful hints of those vibrant yellow reflections. Great sense of space. Wishing you well in 2017, Peter. Thanks so much Steve, and to you. As a fellow artist, you know how hard and gradual “getting better” can be. To hear I’m making progress from a fellow artist…that makes my day! I couldn’t love this more. Having lived in Bratt for nearly 30 years, sadly I am now in MA. I miss so much about this little town and the community it holds. Thanks for the memories and for catching the spirit of this wonderful place! It is a special place, I can see Paula. I hope to return soon for more. Thanks very much! 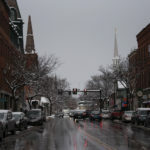 My sister lived in Brattleboro over 20 years ago, great town. Snowing here in Northern Nevada for till the end of the week. Happy New Year Peter. Thanks Brian, happy new year from Vermont! Happy new year, Peter. Fine vedute. Like a boulevard Parisienne but beamed to Brattleboro. Immediately you found a client. This is not astonishing. The new year begins good. Greetings from Berlin. Thanks very much Doris, I learned a new word! I am now a vedutisti? Peter, I love playing around with words and surely you’re not the classical “vedutisti” like Bernardo Belotto. Sometimes, when you leave the countryside and you find yourself in a town then you look for the typical flair of the town and you’ll get it. This is what I wanted to express. Thank you Cynthia, yes, I think the three steeples were a main reason I chose this exact view. The warm jacket is nice, but optional on days like this. Muck boots on the other hand…a necessity! This is a very good painting. I knew exactly where it was before I could blink. I wish I could return & will always call Brattleboro “home”. Thanks Michael, glad you like it! I have lived in Poultney my who life and have admired your work for years. One of my favorites is the picture of Main Street looking down from the high school. I am so glad to have a chance to win one of your pictures.